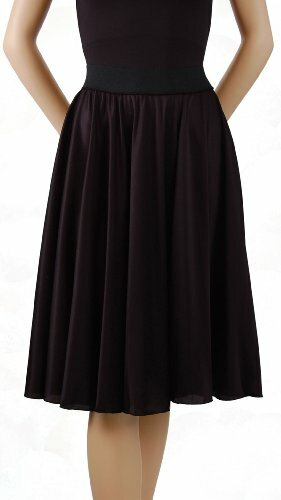 This Trienawear 25" full-circle skirt with a flattering 2" elastic waistband is a pretty and feminine addition to your dancewear wardrobe: perfect for your character and dance classes, rehearsal, summer dance camp, auditions and performance. Beautifully sewn in flowing medium-weight easy-care interlock knit fabric, this versatile skirt is available in 12 vibrant colors. The stretch elastic waistband is black for all colors except for white which is sewn with a white waistband. Available in 5 adult waist sizes: P, S, M, L or XL. Size P fits waists 22"-26", size S fits waists 26"-30", size M fits waists 30"-34", size L fits waists 34"-38", and size XL fits waists 38"-42". The length measurement of 25" is measured from where the elastic waistband is sewn to the skirt to the bottom of the skirt hem. There may be a 1/2 inch variance shorter or longer. Please contact us if you are purchasing for a group and you require more than the available online inventory. Group orders can be made-to-order within 2-4 weeks. 100% Polyester. Hand wash recommended. Made in the U.S.A. If you have any questions about this product by Trienawear, contact us by completing and submitting the form below. If you are looking for a specif part number, please include it with your message.